Welcome to the METTLER TOLEDO webinar on Thermal Analysis of Textiles. Textiles have been produced since the earliest beginnings of mankind and are used in practically all spheres of life. There is a plethora of testing methods and techniques specialized for the textile industry. In this webinar, we will focus on the main thermal analytical procedures used for the assessment of fibers, filaments, threads, fabrics or final textile products. Application examples pertaining to each of these techniques are presented after a brief introduction, explaining the different types of textiles, their applications, and the general principle of thermal analysis. This slide depicts some of the most common challenges in the development of textile products. For example, waterproof yet breathable outdoor gear, colors that don't fade, resistance to wear and tear, and how to avoid shrinkage after washing. Later on, we will see how thermal analysis can be applied to various textiles to investigate their shrinkage or expansion behavior, moisture content, usable temperature range, thermal stability, the effect of UV, and strength. Broadly speaking, textile fibers are divided into two categories, namely natural fibers and synthetic fibers. Natural fabrics such as silk, rock wool, and cotton are made of animal, mineral or plant-based fibres, while synthetics are man-made and produced from different types of polymers to create fabrics like polyester, polyamide, and many others. To improve the properties of the final product, additional components, including dyes or impregnating agents can be added to the fibers or textile fabric. The table is an attempt to summarize the main textile applications and their respective industries. Textiles have many potential uses, be it for our daily lives in the form of clothing or household commodities, or virtually any industry producing medicines, automobiles, or technical and industrial products. Methods used for textile assessment can be separated into three groups: one-dimensional single-fiber testing, two or three-dimensional fabrics testing and assessment of the final product. Two-dimensional fabrics (or tissues) are tested for their tensile and elastic properties, water adsorption and desorption behaviors, and moisture permeability. Depending on their intended use, final products are often tested for color fastness, UV resistance and shrinkage behavior. Characteristics that can be measured by thermal analysis are shown in green, for which I provide more detail in the subsequent slides. The schematic diagram on the right shows a simple linear temperature program. The lower half of the slide illustrates typical events that occur when the sample is heated. For example, initial melting, in which the sample changes from the solid to the liquid state. If the sample is exposed to air or oxygen, it will start to oxidize and finally decompose. We use thermal analysis techniques to investigate these effects. Differential Scanning Calorimetry, or DSC. This is the most widely used thermal analysis technique. The picture shows a DSC sensor with a crucible containing a sample (colored red), and a reference crucible. Thermogravimetric Analysis, or TGA. The picture shows the TGA balance. Thermomechanical Analysis, or TMA. The picture shows the sample area with a sample (colored red) and the quartz probe. And finally, Dynamic Mechanical Analysis, or DMA. The picture shows one of the several different sample-clamping assemblies. Let’s begin with DSC. This technique allows us to determine the energy absorbed or released by a sample as it is heated or cooled. In a DSC experiment, the heat flow from the furnace to the sample is measured relative to the heat flow to a reference material. DSC is commonly used to study the thermal behavior of textile materials. Glass transition and melting behavior are of most relevance for textiles. DSC is also used to assess oxidative stability, composition, thermal stability and evaporation. The picture on the right of the slide shows a view of an open DSC furnace with sample and reference crucibles. 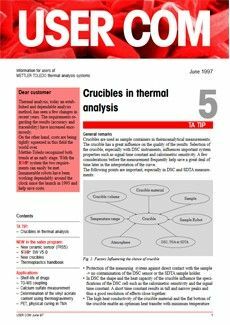 The standard crucibles are made of aluminum. The first application example displays first heating DSC curves for different thread types. Let's start with the heating curve of a rubbery fiber shown in the upper left corner in black. Such fibers can be used in combination with the knitting yarn to get an elastic cuff. They are typically used at temperatures well above their glass transition, which was determined here to be at minus 40 degrees Celsius. In the upper right corner is the DSC curve of a polyester thread shown in red. Melting starts at 160 degrees and ends with the final melt at 260 degrees. Such behavior is caused by reorganization during heating and is typical for polymers. The heating curves of natural fibers, in this example silk and cotton, are shown in blue and green. 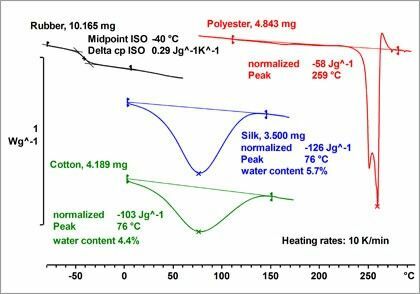 Unlike polyester, the natural fibers show a broad endothermal peak below 100 degrees. The peak is caused by the evaporation of previously absorbed moisture. The peak areas of the measured cotton and silk samples provide an estimation of their respective moisture contents. In fact, the values correspond to the moisture content measured by thermogravimetric analysis for the same samples. As one would expect, such evaporation peaks are no longer visible in a second heating run. In summary, thread assessment by DSC is useful for determining their usable temperature range as well as moisture content. DSC-Photocalorimetry permits the study of light-induced processes. The technique was used in this next example to determine the effectiveness of photocatalytic agents. The slide shows a schematic view of a METTLER TOLEDO DSC-Photocalorimeter. Both the sample and the reference side are exposed to the same light source via a dual-branch fiber-optic light guide. Below are the results of the first UV-DSC experiment performed on sample A at 25 degrees Celsius. The heat flow initially increases when the UV light source is switched on. At this point, an exothermic event occurs, which is explained by changes in the sample caused by the UV-light. After deactivation of the source, the heat flow returns to zero. In theory, this result should be reproducible if the sample is not impacted by the UV light source. The results of performed repeat experiments are presented on the next slide. Results for the repeat experiments are shown in the inset in the lower right corner. The variation in heat flow between experiments 1 and 6 demonstrate the noticeable impact of UV on sample A. The magnitude of the UV impact can be examined by plotting the calculated reaction enthalpies of the heat flow curves against the experiment number. This is accomplished by taking the last measurement as the reference curve, and subtracting it from the other curves. An additional two samples were measured using the same procedure. The results show that UV light has the largest impact on sample B, followed by C and then A. These results can be confirmed by visual observation. 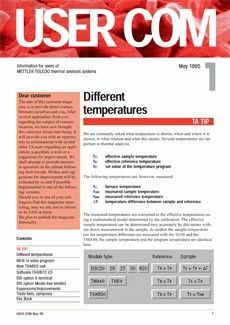 Thermogravimetric analysis or TGA is the method of choice for understanding how a textile material behaves with regard to its composition. In this technique, the mass of a sample is continuously measured as it is heated in a defined atmosphere. We simply put a few milligrams of the sample in a crucible, weigh the sample, heat it and record the mass change. The curve on the left shows a typical TGA measurement of textiles. Initially, before the heating ramp begins, the TGA measures the mass of the sample. At the end of the measurement, inorganic fillers, such as glass fibers, remain as a residue after heating up to temperatures of one thousand degrees Celsius (1000 °C). The mass-loss steps provide us with valuable information about the composition of materials. Five, inorganic fillers such as glass fibers are left behind as a residue. TGA is used to investigate processes like vaporization or decomposition. Evolved gases can be analyzed online using hyphenated techniques such as TGA-GC/MS or TGA-FTIR. The table summarizes the main analytical applications of TGA for textiles. The technique provides information about the composition of samples including their filler content. Furthermore, it allows us to check the thermal or oxidative stability of products, as well as moisture content or the presence of volatiles. The picture on the right side shows a view of an open TGA furnace and a sample holder for both sample and reference crucibles. The following slides describe two types of applications in which TGA is used for the analysis of various fibers. The fibers previously analyzed by DSC were also measured by TGA to investigate their pyrolysis and combustion behaviors. A typical evaluation of a TGA curve is shown by the example of silk, in blue, which was heated from room temperature to 600 degrees Celsius. The decomposition temperature is given by the inflection point on the mass loss curve. After pyrolysis, the atmosphere was switched from nitrogen to air at six hundred degrees, at which point any carbon from the pyrolysis step is burned. Inorganic components remain behind as a residue after the oxidation step. Now I will show you how TGA can be used to check the thermal stability of upholstery fabrics. 3) Yulin, which is the trade name for special glass fibers. All materials decompose in multiple processes during pyrolysis, followed by oxidation in air. The resulting mass loss curves show clear differences between the measured fibers. Modacrylic, presented in green, is the least thermally stable material, which decomposes in several steps above 200 degrees Celsius. PSA, shown in red, also exhibits multiple mass loss steps. The first small step, just above room temperature, is explained by the release of volatiles. The material starts to decompose at about 450 degrees, which is significantly higher than the modacrylic sample. Finally, the blue curve for the Yulin fiber is the most stable up until about 550 degrees. The violent decomposition of the sample causes it to move in the crucible, resulting in random spikes on the TGA curve. The table summarizes important properties, relevant to fibers and fabrics, that can be measured by TMA. Depending on the measurement mode used, TMA allows you to measure thermal expansion and shrinkage behavior, softening, creep and swelling. 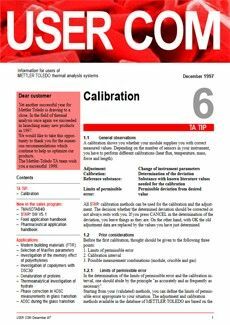 Tension mode is frequently used to investigate the expansion and shrinkage behavior of fibers. The samples are prepared externally using the appropriate accessories. Fibers and threads are fixed in place in the fiber attachment device by means of copper clips. Usually a low force is applied that is just sufficient to ensure that the thread or fiber remains slightly taut between the clips and does not buckle. The following slides describe some common applications of TMA for the analysis of natural and synthetic fibers. A good understanding of shrinkage behavior is important, particularly for materials that undergo stretching or orientation processes during manufacturing. In this example, a PET fiber was measured in tension mode from 40 to 260 degrees Celsius. Below about 75 degrees, the fiber is in the glassy state and is dimensionally stable. At higher temperatures, the sample starts to shrink due to increased molecular mobility. The orientation of the molecules produced in the stretching process during the manufacture of the fiber is gradually destroyed. The rate of shrinkage increases as the melting temperature is approached. The minimum length is reached at about 255 degrees. Following this, the viscosity of the sample decreases dramatically and the sample starts to flow. The next two examples describe TMA applications for the assessment of fiber strength in both natural and synthetic fibers. Let's start with a comparison of various natural fibers. ten thousand meters of fiber. This allows us to apply a normalized tensile force, in this example 0.1 millinewton per decitex de cee tex, to compare the expansion or shrinkage behavior of fibers with different linear densities. Human hair, shown in the blue curve, initially shrinks under heating. Decomposition begins at about 220 degrees Celsius and the fiber rapidly tears. Horse hair, in the black curve shows relatively little change in length until about 200 degrees. Conversely, wool, shown here in red, expands in the same temperature range by more than 2%. Silk and cellulose fibers (for example cotton and hemp) show very little change until they decompose and break at about 400 degrees. Unlike natural fibers, thermally stimulated shrinkage in synthetic fibers is heavily influenced by processing conditions. For example, the shrinkage of polyethylene, or PE for short, at the onset of melting is the result of a special manufacturing process, in which fibers are stretched after spinning. Normally, irreversible shrinkage begins above the glass transition temperature. This is shown for the PET samples above 80 degrees Celsius, in the green and the blue curves. For polyamide-66 fibers, shown in the red and the black curves, shrinkage already starts just below 50 degrees. The sudden increase in length is triggered by the onset of melting above 250 degrees. Since the measurement force is normalized to the linear density, the TMA curves of a yarn (with many fibers) are identical to those of an individual fiber taken from the same yarn. For example, the comparison of PA66 with 44 and 1400 dtex dee tex shows the excellent reproducibility of such measurements. The last fiber we want to focus on is Polyacrylonitrile, or PAN, shown in the brown curve. This fiber is dimensionally very stable up to about 130 degrees. At higher temperatures, however, PAN expands even more rapidly than wool. Another application of thermomechanical analysis for the characterization of fibers is the determination of Young’s modulus ee prime (E'), and its dependence on temperature. In this application, Dynamic Load TMA was used, which applies a periodically alternating force to the heated sample. The upper half of the diagram shows the length of the PET sample as a function of temperature in two heating runs. The amplitudes of the DLTMA curves are a measure of the elasticity or the Young’s modulus of the sample. The corresponding curves are shown in the lower half of the diagram. Upon closer scrutiny, one can observe a decrease in Young's modulus as soon as the glass transition begins at 68 degrees Celsius. Below this temperature, the Young's modulus is somewhat lower in the second heating run, which is explained by the shrinkage of the PET fiber during the first heating. Above 120 degrees, i.e. above the glass transition, the Young’s modulus values are the same for both heating runs. Dynamic mechanical analysis measures the mechanical properties of a viscoelastic material as a function of time, temperature and frequency when the material is deformed under a periodic oscillating stress. The schematic diagram on the left shows the results of a DMA measurement of PET measured in shear mode. The curves display the storage modulus gee prime (G′), loss modulus gee double-prime (G″),and tan delta as a function of temperature. The table is a summary of the main analytical applications of DMA for textiles. In general, DMA provides information about the mechanical modulus, compliances, and damping and viscoelastic behavior of materials. The glass transition temperature, softening temperatures, or beta relaxation processes are detected as peaks on the tan delta curves or through changes in the modulus. In our first DMA application we investigated the Stress-Strain behavior of a commercially available cotton fiber. The Stress-Strain curve permits quasi-static mechanical properties to be observed over a large deformation range. For this, the fiber is subjected to an increasing tensile stress and the resulting change in length is measured. The diagram shows the Stress-Strain curve at 30 degrees Celsius. Up to about 0.5% deformation, a linear relationship is found between stress and strain. The elastic modulus of about 20 giga-pascals is given by the slope of the curve. In the non-linear region, at higher strain values, the curve flattens off and the modulus decreases. Such Stress-Strain experiments permit the assessment and comparison of strength, stiffness, and expansion behavior in fibers. It is also possible to investigate these properties under different humidity conditions or in a water bath. An example of this is described on the next slide. Liquid environments usually impact the mechanical properties of materials. For example, certain liquids cause polymers to become hard and brittle, whereas others act as plasticizers. 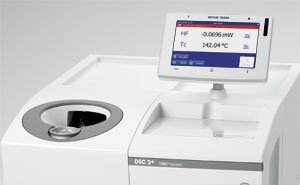 The DMA water bath option permits the mechanical behavior of a sample to be measured whilst fully immersed in a liquid. The example shows the Young's modulus, ee prime (E'), and tan delta curves, of a polyamide thread measured in water at 20 and 40 degrees Celsius. The glass transition temperatures, shown as peaks on the tan delta curves, decrease due to the absorption of water, which acts as a plasticizer. The observed differences between the two experiments are indicative that the softening process is quicker at 40 degrees compared to 20 degrees. I would like to conclude this webinar with a summary of the main points discussed. Important textile properties, and the thermal analytical techniques used to measure them, are summarized on this slide. The recommended techniques for each measurable effect are marked in red. Effects that can be accurately measured by DSC are glass transition, melting behavior, reaction enthalpies, and the influence of fillers. For TGA, the main applications are composition analysis, thermal stability and evaporation behavior. and DMA is the best method for characterizing the viscoelastic behavior of materials. In general, DSC experiments are performed at temperatures between minus one hundred and fifty degrees Celsius (–150 °C) and plus seven hundred degrees (700 °C). The temperature ranges may be different if special equipment or accessories are used. TGA measurements normally begin at room temperature. The maximum possible temperature is about sixteen hundred degrees (1600 °C). TMA experiments can be performed between minus one hundred and fifty degrees Celsius (–150) and plus sixteen hundred degrees (1600 °C). DMA samples are measured in the range minus one hundred and fifty degrees Celsius (–150 °C) to plus six hundred degrees (600 °C). Finally, I would like to draw your attention to information about textiles that you can download from the Internet. 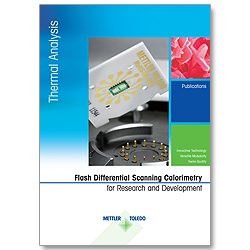 METTLER TOLEDO publishes articles on thermal analysis and applications from different fields twice a year in UserCom, the well-known METTLER TOLEDO biannual technical customer magazine. Back issues can be downloaded as PDFs from www.mt.com/usercoms as shown in the middle of the slide. In addition, you can download details about webinars, application handbooks or information of a more general nature from the internet addresses given on this slide. This concludes my presentation on textiles. Thank you very much for your interest and attention.